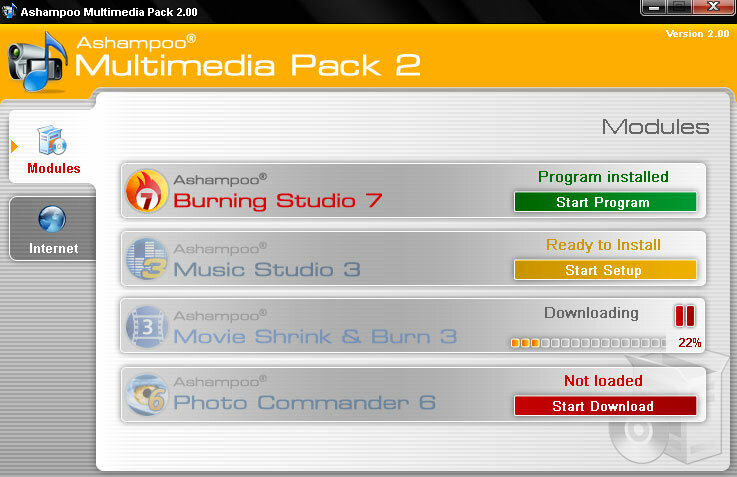 Ashampoo Multimedia Pack 2 is the control, installation and launch centre for Ashampoo`s popular multimedia management, editing and authoring applications. Ashampoo Photo Optimizer - Whip your photos into shape with just a click of the mouse! Ashampoo ClipFinder - Find and immediately download videos from YouTube, VideU, MyVideo, ClipFish, Google Video, sevenload, Dailymotion and many more at the click of a mouse! Ashampoo Magical Defrag 2 - The end of fragmented disks. Really. Ashampoo ClipFisher - Download, Edit, Play and Convert Videos from YouTube, MyVideo, GoogleVideo, Metacafe, sevenload, MySpace, VideU & ClipFish! Ashampoo WinOptimizer 5 - 10 years of experience in windows optimization - Get ready for round 5!